“Stop Starbucks in Yosemite” reads the petition. And nearly 23,000 people have signed, expressing discomfort at the thought of corporate consumerism sullying one of America’s oldest and most venerable national parks. The online protesters said they are concerned that the arrival of a Starbucks — slated to be part of a food court attached to Yosemite Lodge — will open the door to more big name restaurants and retailers. While there is no evidence that McDonald’s, Krispy Kreme and Walmart are bridling to take their place in the great outdoors, it’s not surprising that environmentalists are worried. The National Park Service has kept brand names at arm's length by custom, but never banned them by law or regulation. In fact, the history of America’s national parks is inextricably linked to corporate America — but previously by companies that remained mostly in the background. It began in the early 1900s, when railroads built many of the luxury lodges that became national park landmarks. And it continues today with big concession companies that operate most of the restaurants and hotels inside park boundaries. The Starbucks scheduled to open this spring in Yosemite Valley will arrive through a side door. It’s not a free-standing Starbucks, operated by the Seattle-based corporation. Instead, it will be an outlet of the coffee giant licensed and operated by another giant multinational corporation, Aramark, using the Starbucks logo and products. Brewster, a rock climber and one-time hiking guide in the park, said he is disturbed that the public did not get more notice, and chance to comment, about the encroachment of the $87 billion company into the 128-year-old home of El Capitan and Half Dome. “It seems the park service is putting profits over conservation,” said Brewster, 31. The Park Service granted a contract to Philadelphia-based Aramark in 2016 to operate hotel and food concessions inside Yosemite. Those businesses brought in nearly $120 million in revenue that year, part of about $1.5 billion in proceeds generated by national park concessionaires across the country. The Park Service took a cut of about $125 million of that grand total. But some advocates have suggested that the struggling agency, with a $12 billion backlog of capital projects, could make more if it expanded concessions. Park Service officials said that their 15-year contract with Aramark does not give them power to overrule Starbucks or other vendors, as long as they are providing goods and services outlined in the contract. An Aramark spokesman said the company is merely trying to respond to public demand and that the anti-Starbucks forces have mischaracterized plans for the Yosemite cafe. The coffee outlet will occupy existing space in a food service building where Peet’s Coffee previously had been offered, said Aramark’s David Freireich. “This and the other new and improved offerings that are part of Yosemite Valley Lodge’s food court renovation are reflective of guest feedback we’ve received,” Freireich added, via email. Starbucks did not respond to a request for comment. There has been no indication that the corporation, valued at $87 billion, has any reservations about moving to the spot close by the Merced River. Previously, the most obvious corporate brand in the California park was Chevron, which has gas stations in Wawona, Crane Flat and El Portal. In years past, corporations arguably carved out much bigger niches in the national parks, though their hotels and other businesses typically did not carry the names of their creators. 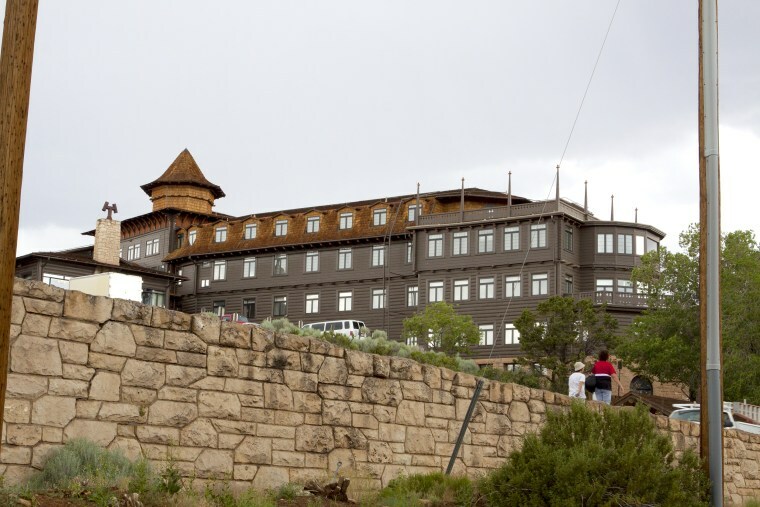 The Atchison, Topeka and Santa Fe Railway built a hotel on the rim of the Grand Canyon in 1905 to lure tourists West. Five years later, the family controlling the Great Northern Railway brought a string of hotels and chalets to the line that ran through Montana's Glacier National Park, which the family helped to create. Two of the biggest concession operators in today’s national parks are also significant corporate powers. Aramark has a market capitalization of more than $11 billion. It operates businesses in Denali, Glenn Canyon, Mesa Verde and Glacier Bay national parks. That footprint is dwarfed by the one created by the national parks’ largest concessionaire, Xanterra Parks & Resorts, which runs businesses in Yellowstone, Grand Canyon, Zion, Crater Lake, Rocky Mountain and Petrified Forest national parks and at the Mount Rushmore National Memorial. The company has more than 5,000 hotel rooms in nearly 30 locations. Xanterra was acquired in 2008 by entertainment and sports magnate Phillip Anschutz. But most of Xanterra’s hotels carrying geographical or historic names — Old Faithful Inn, Roosevelt Lodge Cabins, Zion Lodge — so visitors would have no reason to know their rooms are being provided by a corporation controlled by one of America’s wealthiest men. But Brewster, the petition creator, said he and his supporters are worried.